When the Buddha awoke from the dream we still dream, he saw the ultimate reality of things just as they are. There are shifting appearances and conventions, the manners and traditions of the vast and diverse world; and then there is the mystery of the sheer reality of things. And yet we cannot find this reality anywhere else but right here. Each system of Buddhist philosophy has its own way of explaining exactly what these two truths are and how they relate to one another. In exploring these systems, we are looking over the shoulders of Buddhist thinkers as they grappple with a basic question: What is real? This is not an idle intellectual exercise, but a matter which cuts to the heart of our practice in life. Guy Newland received a Ph.D. from the University of Virginia in 1988 and is now Associate Professor of Religion at Central Michigan University. He has studied with several leading tibetan scholars in the U.S. and India. 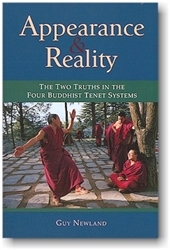 One of his earlier works, The Two Truths, analyed the Geluk view of Nagarjuna's two truths doctrine. He has collaborated with Joshua Cutler in editing the first complete English translation of Tsonghkapa's Great Treatise on the Stages of the Path to Enlightenment.